ALEXANDRIA, Va. (Jan. 30, 2009) -- Time off for Soldiers to grieve the loss of a loved one, official photos for all Soldiers in the event they are killed in battle, and a place for Soldiers in barracks to keep their gear. Those are some of the topics Army senior leaders will now focus on as a result of the 2009 Army Family Action Plan conference. 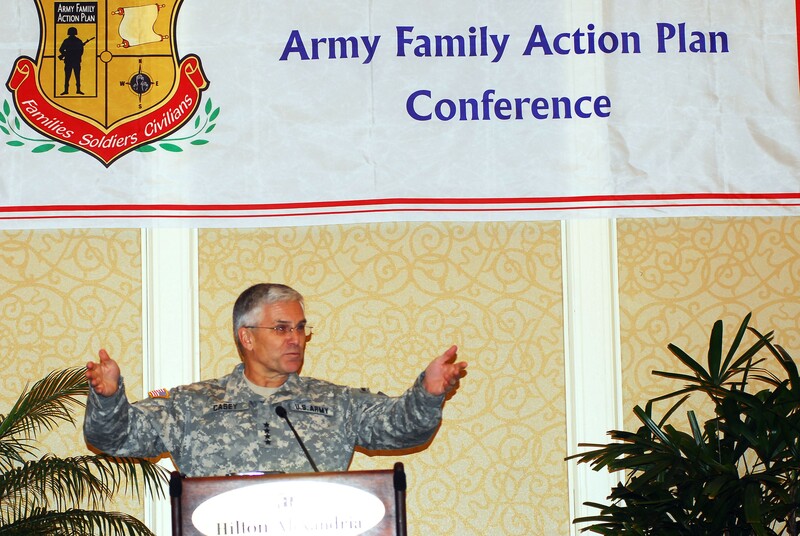 The Family and Morale, Welfare and Recreation Command hosted the 2009 AFAP conference here Jan. 26-30. The week-long conference is the final step in a process where issues identified at installation level -- and seen to affect all families and Soldiers -- are elevated all the way up to Army senior leadership. Chief of Staff of the Army George W. Casey Jr. attended the final "report out session" of the 2009 Army Family Action Plan conference in Alexandria, Va., Jan. 26-30. Recommendations to Army senior leadership at the conference included providing time off for Soldiers to grieve the loss of a loved one, official photos for all Soldiers in the event they are killed in battle, and a place for Soldiers in barracks to keep their gear. This year, eight different workgroups collaborated at the AFAP conference to decide which issues were significant enough to present to Army senior leaders during the conference's last day "report out session." Senior leaders voted on which five of those issues would become the focus of increased attention. As a result of recommendations during the conference, Army leaders in the coming months will look into providing a new permissive TDY category to Soldiers who have lost a loved one -- a so-called "bereavement permissive TDY" category. Today, Soldiers must take chargeable leave or request a pass in the death of an immediate family member. "Insufficient time for grieving the loss of a family member and administering responsibilities impacts the Soldier's and family's ability to mourn and recover from a traumatic loss," read the final report of the benefits and entitlements work group. In the past, there have been instances where Soldiers who have died while serving overseas have not had suitable photographs to serve in memorial ceremonies or to provide to the media. Recently, the civilian press reported that in the case of two Soldiers who had been killed in Iraq, the Army unit had provided a doctored photo of one of the Soldiers because a more suitable photo could not be found. "Official photographs are not required for all Soldiers," read the final report of the Force Support Work Group. "There is no official photograph available to the media that provides a professional head and shoulder view of the Soldier with individual achievements. Personal photos have been used in the media to identify Soldiers. But inappropriate or grainy photos do not accurately reflect the professionalism of the Army or the Soldier." The work group recommended the Army require professional or semi-professional head shots for all Soldiers. That suggestion will be researched now by senior Army leaders. • Providing standardized respite care for Wounded Warrior caregivers. "Primary caregivers are vital in the life of a Wounded Warrior and in their recovery," said Rosie Babin, mother and caregiver of a wounded Soldier. "But commonly, the demands of caregiving cause burnout and compassion fatigue. Statistics show that caregivers who provide care 36 or more hours weekly are more likely than non-caregivers to experience depression or anxiety -- for spouses, the rate is six times higher." Babin's Family Support Work Group recommended the Army provide uniform availability of standardized respite care to all caregivers of Wounded Warriors. Respite care means providing support to the caregiver -- providing them with the time they need to take care of themselves so they can continue to provide care to their Soldiers. "By providing temporary relief from the demands of daily assistance to Wounded Warriors -- who typically have complex chronic medical conditions and functional ability -- caregivers can continue to provide maximum support and care," Babin said. Chief of Staff of the Army George W. Casey Jr. thanked conference participants for the suggestions they had brought to his attention, and discussed with them the challenges the Army is tackling now to help relieve some of the stresses faced by today's Army families. The general told attendees that the Army is "out of balance," and that one of the imperatives that must be met to get the Army back into balance is the sustaining of Soldiers and their families. "That's the number one thing we have to do," the general said. "The volunteer force is a national treasure. And the work we are doing on the Army Family Covenant is an important part of our effort to sustain this force." The general also said that preparing Soldiers for war is one of the imperatives, and that increasing dwell time at home station is a significant part of that preparation. "The most important thing we can do to prepare folks is to increase the time that Soldiers spend at home between deployments," he said. "And one of the major elements of the plan to get ourselves back in balance is to increase the size of the Army over the next three years." Increasing the size of the Army means more Soldiers to deploy and less deployment demand on each Soldier. Casey said he planned to have the Army's growth plan completed by 2010 -- but recruiting and retention have made it possible to meet those growth objectives this year. "If you hold demand steady, and you increase our growth, then over the next three years what you see is (that) the average dwell time gradually improves," Casey said. Casey said the Army was operating at less than one year dwell time per one year deployed time when it was using 15-month deployment cycles. Now, he said, the Army is deploying Soldiers for 12 months. This year, he said, he expects the dwell time to increase to nearly 18 months, and in 2010 to actually reach 18 months. By 2011, he said, it will reach 24 months -- if demand stays steady. "Time that Soldiers spend at home is important for a lot of reasons," Casey said. "It is important for them and for you so that they reconstitute themselves -- and the family. Second, it gives them time to start working on other things, and third, it gives us time to get them the equipment and the people they need to get ready for what they are doing next." The Army hosted the first AFAP conference in 1983. Since then, the efforts on the part of conference attendees have resulted in the resolution of some 435 issues. Recommendations to Army senior leadership by AFAP conference attendees have resulted in 107 legislative changes, 154 policy changes, and 173 programs and services improved.